As part of its action within the European Centre for Press and Media Freedom , OBC Transeuropa has organised the third edition of the Wiki4MediaFreedom edit-a-thon, an initiative aiming at improving media freedom-related content in Wikipedia. The edit-a-thon will take place on January 18th (Friday), from 16:00 to 21:00 in Madrid, Medialab-Prado (calle Alameda 15, Madrid). A portmanteau of “edit” and “marathon”, the edit-a-thon is an organised editing event featuring a bottom-up, collaborative experience of knowledge production, where editors work together to improve specific Wikipedia contents. To this aim, the Wiki4MediaFreedom edit-a-thon will gather media freedom activists, journalists, media experts, and a group of experienced Wikipedia volunteers. Also, the event aims at fostering new alliances between media freedom activists, journalists, and the Wikipedia and open knowledge communities to stimulate the growth of a transparent, plural information ecosystem. For half a day, participants will work together editing articles related to some of the most concerning issues affecting the media systems in Europe today, and namely: transparency of media ownership, media concentration, access to public information and self-censorship, independent journalism, and so on. After a short introduction and a tutorial on Wikipedia editing processes, 4-5 hours of collaborative editing will see experienced Wikipedia editors working side by side with participants to edit entries, verify sources and references, and fill in missing information. At the end of the session, a light dinner will be offered by organisers at the MediaLab bistrot. Madrid’s edition is the third edit-a-thon of the media freedom series, after the events in Belgrade (2016) and Sofia (2017). 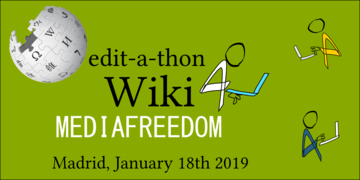 The edit-a-thon is part of the Wiki4MediaFreedom initiative that, since 2015, has been working to improve the quality of content in multiple languages related to media freedom and pluralism in Europe in Wikipedia. All the Wikipedia articles created in this framework are available in the Resource Centre for Press and Media Freedom , a digital curation platform providing systematic access to curated contents related to media freedom and pluralism in Europe. The edit-a-thon follows up on the GLAM project (“Galleries, Libraries, Archives and Museums”), a global Wikipedia initiative which helps cultural institutions share their contents with Wikipedia and its many collaborative projects, implemented in 2015 by OBC Transeuropa in cooperation with Wikimedia Italia. For further information, please check the page in META . The registration form (in Spanish) is available here .